Match and pop colorful bubbles in over 1000 captivating levels! A huge thank you to our fans for allowing us to reach 25 million downloads! We promise much more bubble-popping fun to come. 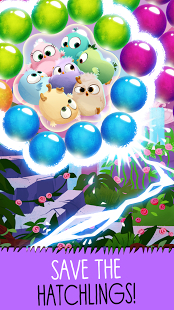 Join Stella, Red, Chuck, Bomb, and the rest of the Angry Birds in an extra addictive bubbleshooter bursting with an nearly endless supply of challenges! Pull off trick shots and popping streaks to activate special pops with unique powers. Those special pops will come in handy when you’re rescuing the utterly adorable Hatchlings, or dropping those pesky piggies across the winding level map. Connect to Facebook and compare scores with friends, or if you’re feeling generous, you can always send them some gifts! – Over 1000 levels! New levels added every week. – Play as and guest characters with their own special pops. Join a magical tale as old as time, but with slingshots, and lots of bubbles! – New Beauty and the Beast area!